APCNDT has afforded me the honour and opportunity of presenting two papers at this conference and in my other presentation I discuss "AGFA and the Environment". I discuss just how NDT film and chemistry technologies can impact, in a detrimental manner, on ecology and ultimately our environment. Solutions and suggestions are offered, and I hope accepted by the NDT industry, with the view that we can leave a safe, cleaner environment for our children. However, one of the solutions not touched on was that of foregoing the tried and true silver halide technologies in favour of that which the emerging digital technologies can offer. 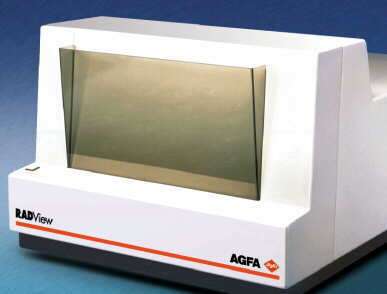 AGFA can trace its NDT roots back to 1939 with the introduction of its first radiographic film product and since then has been a leading supplier of radiographic film to the NDT community. It is only in recent times (August 1999), when we acquired the American company RADView, that we were able to offer digital solutions. The acquisition of Krautkramer followed, allowing us to pursue the ultrasonic market and offering a more comprehensive choice from a world market leader. Offers of intent to Seifert & Pantak followed, offering an even wider choice. As an aside, but as a further insight into our quest for solutions and new techniques in rapidly evolving technologies is our most recent acquisition of Talk Technology, North America's leading supplier of voice enabled clinical workflow and reporting solutions for healthcare. In short voice recognition. But I digress. Back to digital radiography and where does it fit into today's NDT environment. For over 60 years, x-ray film has been the standard for industrial radiography because of its functional utility and perceived high image quality. It has performed the functions of capture, display, storage and communication of the image data. Until now, all efforts to integrate NDT film radiography into the digital environment have been compromises requiring both intermediate conversion steps and additional work by the technician or technologist. Only recently has it become technically possible and economically viable to use electronic technologies to supplant film for 3 of its 4 functions - image display, storage and communication. The missing piece has been an effective method of capturing high-resolution x-ray image data in a digital format having the resolution and sensitivity of fine grain industrial film. Depending on the application, the digital systems I will discuss with you today allow faster production, better accuracy and safer use. Moreover, and once again depending on the application, we can eliminate chemical processing and waste, reduce overall exposure and viewing cycle times, increase storage life to 100 years and transmit images rapidly to remote sites. And throw in a set of steak knives as well! I don't want to give the impression that silver halide technology, as we know it, is redundant. Digital has its shortcomings and during this presentation they will become obvious. But we cannot ignore the obvious......digital systems and technology of this ilk is emerging in every facet of imaging, especially medical x-ray where we see almost every state in Australia, especially here in Queensland, embracing "filmless technology" in the form of AGFA PACS (Picture Archiving Communication Systems). Interest here in an industrial x-ray or NDT system is high and will more than likely follow the lead of our US and European cousins where digital installations, being either Computed Radiography (CR) or Direct Radiography (DR) are becoming the norm in certain industries. In the US for example there are about 12 AGFA DR systems in foundries which cast aluminum and steel parts. Because of current limitations in ASTM codes for final inspections they are mainly utilised in in-process inspections of wax or rough metal works although at least two units are used in electronics and plastics inspection. Major efforts are being focused on updating the relevant codes so that we can extend digital technology into final inspection. In Alaska, our biggest CR installation, is being used for erosion/corrosion work and is producing several hundred images per day whilst another installation involves a nuclear power station doing similar inspection. So you can see, we are not talking today about the future, we are talking now. But more of that later. Foundries seem to rate highly on the digital installation list, and AGFA has recognised that digital is a fast emerging technology. Therefore we are aiming for a common platform for all digital modalities. more precise information and has the potential to be an excellent tool for trending analysis for predictive preventative maintenance. Whilst this is a simplistic example, I believe that it does demonstrate that digital radiography does fit into today's NDT environment, and depending on the application this new technology can be introduced to reduce costs and increase productivity. But perhaps we are getting ahead of ourselves. Successful implementation of a digital radiographic system involves a number of considerations. These include exposure conditions, image quality requirements and the already mentioned productivity. Not unlike conventional radiographic film, digital radiography exhibits a wide range of resolutions, speeds and throughput capabilities, and no one solution can meet all radiographic needs. The right choice depends on the application. Two performance characteristics of these systems can help determine which is the right method for your application; resolving capability and penetrametor sensitivity. Although radiographers are familiar with penetrametor sensitivity through the use of Image Quality Indicators (IQIs), resolving capability is not usually measured. Since film exhibits such a high intrinsic resolution there is no normal requirement for this measurement. However, digital methods have a much lower resolution than film. Whereas film granularity can be in the order of microns, commercial digital detectors are typically 100 microns or more. Therefore, when evaluating which digital system is right for your needs, both the penetrametor sensitivity and resolving capability must be considered. Procedures that define penetrametor sensitivity and provide measurement methods for it, are available in standards documents. At present, to my knowledge, there does not exist an NDT standard for measuring resolution, although there are well established methods for evaluating a system's resolving capability. If we had an extra hour we could discuss at length the definition of resolution and how to evaluate resolving capabilities of different imaging systems and how best to measure the contrast of adjacent objects as a function of their separation distance. This is called Modulation Transfer Function (MTF) or sometimes contrast transfer function. By measuring MTF, it is possible to evaluate how effectively a system can detect small changes in contrast as a function of their separation. In order to simplify the measurement, the separations are stated in terms of spatial frequency, which is the inverse of distance. As the spatial frequency increases, so does the resolving capability. As the MTF at a given frequency increases, the image will more easily distinguished between closely spaced features and appear sharper to the human eye. This means that flaws will be more easily detected at a higher MTF. As already discussed, the subject of MTF is a subject in its own right so permit me to take it that you are conversant with the fundamentals because in addition to knowing the imaging systems' MTF, the radiographic equipment also has a resolution limit or MTF. As radiographers know, there are various factors in the exposure process that also limit the image resolution. The object thickness, source size (focal spot or isotope size), and source to object and source to detector all combine to produce a geometric unsharpness which limits the image resolution. Therefore, the detector should have an MTF curve that matches or slightly exceeds the MTF associated with image unsharpness due to the radiation source. For example, although Computed Radiography (CR) exhibits a lower rate of MTF than film, it is in fact a good match for the resolution achievable in many gamma radiography applications. In these applications, the blur associated with the exposure geometry can be comparable to the resolution of the CR imaging system so that no information is lost. Helps extract greater information from film and assist in long term archiving. The benefits of a film digitisation system include saving money by reducing overall radiography and records management costs; preserving images on removable media, minimising the risk of lost or degraded records; electronically transferring images for cost effective review and remote analysis; providing superior analysis tools, yielding consistent reparable interpretations and measurement of defects. Current users of this technique include NASA, Boeing, Pratt and Whitney, USAF, Duke Power, United Technologies, EPRI, Exxon, White Sands Missile Range, Aberdeen Proving Grounds, BAM, Electicite de France and The Fraunhofer Institute. Suitable for applications where coarse grain film is employed. CR or filmless radiography systems are achieved via a radiation pattern on a re-useable phosphor screen, creating a latent image which is read (digitised) by a CR reader. This data is processed by a Workstation and creates a digital radiographic image. The AGFA CR System offers standard sizes of phosphor plates, 8"x10" (18x24cm) and 17x14" (35x43cm) with the plates being re-useable. The scan time is 10 to 120 secs and there are no chemicals. As far as image quality is concerned it can be compared to D7 or D8. In a nutshell, this means that typical exposure time's range from 2 to 20 times less than film, depending on the image quality required. Exposure latitude is over 1000 times more than film and the re-useable screens eliminate the need for chemical waste disposal. It also means that there is a reduction of under or over exposures, and because the phosphor plates are flexible they can be bent into shape, to a degree. Suitable for applications where medium and finer grain film is ;employed. 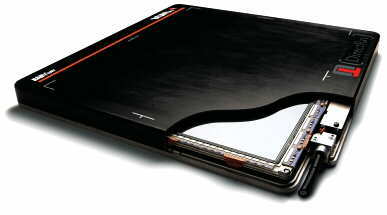 There are two types of flat panel arrays available for radiography. The first being "indirect" involving phosphors and scintillator x-ray to light conversion layer coupled amorphous silicon photodiode and thin film transistor (TFT) arrays. An ability to be retro fitted to existing x-ray cabinets. Allowing organisations such as Boeing, National Security Agency, Howmet and Allied Signal the ability to achieve film like digital imaging technology; immediate feedback thus speeding up inspection flow; enhance workflow through networked distribution of images and associated test data and eliminate consumable costs. Central to optimising any of the aforementioned systems is AGFA's Intel-based computing hardware solutions and a Windows operating system for optimum performance and reliability. These systems are designed to provide integrated solutions for NDT imaging and information management with RADView image acquisition and diagnostic viewing software. RADView workstations and software solutions are fully integrated with your input and output, and undergo extensive testing prior to shipment. Optimum image display is a result of this software and enables consistent, repeatable inspections through superior image display tools. Once an image has been retrieved and displayed on a high-resolution monitor, there are a number of ways that the image may be optimised enabling a thorough inspection whilst preserving the original image data. Radiographic images can contain significantly more information than the human eye can discern. The full range of densities can be viewed with RADView's density window width and level control. It is therefore possible to specify electronically a selected range of density to achieve optimum contrast display. This feature is beneficial even when viewing digitised film images, since small changes in density can be more clearly visualised than light box viewing. RADView Software can magnify entire images or specific regions of interest to accurately locate, characterise and measure indications. An easy to use pan/scroll tool makes it possible to move around an image at a specific magnification factor. It is possible to create a region of interest that can be enhanced independently of the background and scrolled around the radiograph similar to a magnifying glass. RADView offers a range of fixed and user defined image-processing tools. A palate of smooth and sharpen filters is provided to enhance difficult to see indications or edges. In addition, user-defined kernels up to 9 x 9 matrix are provided to maximise image processing flexibility and customisation. It offers many image processing functions to enhance the radiographic images. However, it archives all image files in their original state to preserve the integrity of the raw data. All viewing settings are saved eg contrast levels, filters and magnification and magnification, used at the time of interpretation. It is therefore easy to audit interpretations years after the original inspection. Images can be easily exported in many standard graphic file formats and in this way, remote users can receive information and view inspection results with any standard viewing software. It all operates on a PC platform within an industry standard Windows NT operating system and easily catalogues, maintains and retrieves images and associated test data to prevent misplaced or lost information. Built-in security layers include user ID, passwords, and audit trails to prevent unauthorised access to critical test data. To save images and database information, RADView offers both optical and magnetic storage solutions tailored to your needs. In terms of data output you can have hardcopy with digital images being printed out to any local or network printer. Printing images is monitor resolution independent. Image Hardcopy will keep the scale, filters and Window-level of the displayed image. As far as archiving is concerned, digital images and related information can be archived to any storage location on the network. as a solution for archiving, both optical and magnetic storage solutions are offered, depending on retention requirements. These include multiple hard drives, magneto-optical drives, tape drives and juke boxes. And let's not forget the capability of exporting or transferring any image acquired to a remote or distant location for further interpretation, confirmation or comment. All this and the steak knives as well! As can be seen, this RADView system offers a complete integrated solution for radiographic NDT imaging and information management. It can manage large volumes of test information from a stand-alone workstation or from multiple workstations on a network. Industrial radiographic imaging remains one of the best methods to visually inspect, interpret and measure the integrity of many components. Advances have been made in digital radiography methods, as has been demonstrated today, but the vast majority of industrial radiography or NDT is still performed with traditional/conventional silver halide technology, a method that dates back to the discovery of x-rays over 100 years ago. The reasons for this limited replacement of film, by digital methods include the expense and generally large size of previously available systems. Though systems can be cost effective for inspections in a high volume manufacturing environment, they cannot compete with the relatively low cost of film in most radiography situations, especially field radiography....yet. Another important factor is that whilst the digital image is more than suitable for most radiography requirements it is yet to achieve the quality, resolution and detail of some of the finer grain films currently available. This is a limiting feature of the current range of digital technology. But for how long? NDT is in the early stages of embracing digital technologies, but as was indicated earlier some of the leading lights of the NDT fraternity have taken the plunge and are reaping the benefits. From a medical x-ray perspective, the success of digital is well documented and I would suggest it is being used extensively in your home country. Have the confidence that our medical colleagues have in this exciting new technology. It is not an easy decision to make, but AGFA has in place ways and means to assist in helping anyone who is interested in exploring the opportunities that digital can offer your particular applications. Digital is here, and I look forward to the next APCNDT where I will be able to address you on the success it is achieving in the Asia Pacific region.